As my readers all know, I am a proponent of non-violence in general and in specific, I am a proponent of preventing and reducing the violence caused by firearms in our communities. I know I am not alone. Others blog about this stuff. This person wrote a great blog post about violence in America. When you see all the facts put into one place as this blogger did, it's pretty stunning. I suggest you take a look at all of the statistics in the linked post. They are important to understand. Now we all know that there has been violence since humans started walking the earth. Unfortunately people find a way to kill each other (or themselves) in jealousy, in rage, over food, over stuff, over lovers, over custody of children, over a comment made, over driving in someone's lane, over money, over territory in urban areas ala gang activity, over walking around in a neighborhood while black, over losing a job, over loud noise in a car, over taking out the garbage, over mistaken identity, while depressed, after drinking too much or being on drugs, in fear, in paranoia, and just in general. People may use bats or knives or fists or whatever is available- a candlestick? But guns just make it all so much easier. It's easier to commit suicide with a gun, to kill your partner, to kill a kid taking out the garbage, to kill someone over a driving dispute, to kill a lot of kids at an elementary school, to kill a lot of people at a movie theater, to kill a bunch of co-workers at a place of business, to kill a bunch of students and professors at a college, etc. You get my point. Funny isn't it that you just don't see a lot of these kinds of killings with bats, fists, hammers, etc? And don't send me your examples of cases where people are killed by these other methods. I'm aware. We all know that guns have killed more people than these other methods combined for many years now in America. It's just common sense information. Scott, 36, says he should be granted immunity from going to trial on murder charges. But others told the judge that if Scott isn’t prosecuted, South Carolina will move one step closer to becoming a free-fire zone where people shoot and kill innocent bystanders with impunity. According to all the evidence in a pre-trial hearing on the issue, Niles was across a street and in no way threatening Scott when the teen took a .380 bullet to the head in April 2010 near Scott’s house off Beltline Boulevard near Two Notch Road. He died almost instantly. Scott has admitted firing the shot that killed Niles, but argues he should not be prosecuted since he believed himself in danger from other people at the time he killed Niles by mistake. The case’s final outcome could significantly broaden the state’s “Stand Your Ground” law which, when passed in 2006, expanded traditional notions of self-defense by giving people a broad right to use deadly force not just on their own property but whenever and wherever they feel threatened in a place they have a right to be, a prosecutor told Judge Maite Murphy. If Murphy grants immunity to Scott it would be “be the first time any state in this Union” has granted immunity for killing an innocent bystander in a Stand Your Ground case, 5th Circuit Assistant Solicitor April Sampson told Murphy. “If this law were to be applied the way (Scott) wants to apply it, he could shoot a 4-year-old playing in her front yard and still be immune from prosecution,” Sampson said. “If you want to make it the Wild, Wild West .... (to) say you don’t have to act with care when you say you’re scared, that you can shoot someone who is not a threat to you,” Sampson told Murphy. But Scott’s lawyer, Rutherford, urged the judge to give his client immunity. At time of the shooting, about 1:30 a.m., Scott was in fear of his life, and he was the only one who could take action against a carload of menacing teen “women thugs” who had just followed his daughter and her girlfriends home on the night of April 17, 2010, Rutherford said. On their way home, his daughter telephoned Scott to tell him they were being followed. He met them outside and told them to go and lie down on the kitchen floor while he went outside with a pistol. It is unreasonable to expect that Scott is required “to go back into his house, in his castle ... and hope that the cavalry (police) are going to come ... . All that matters is that Mr. Scott felt his life was in jeopardy. We know that because everyone there felt their lives were in jeopardy,” Rutherford said. Rutherford acknowledged that Niles was an innocent bystander, who in all probability was on the scene because he intended to help Scott’s daughter. The real villains in this case, Rutherford said, are the carload of teens that followed Scott’s daughter and her friends home from a club. They should be charged with “felony murder,” a charge that means that they caused Niles’ death, even though Scott was the one who put the bullet in his head, Rutherford said. That is the same principle applied in cases in which a store owner who shoots and mistakenly kills a bystander during an armed robbery, Rutherford said. The store owner isn’t charged with the bystander’s murder, but the robber is, Rutherford said. When someone like Scott, in fear for his life, shoots his gun, “they cannot be expected to shoot straight always because they are not supposed to have their life in jeopardy,” Rutherford said. Scott was fearful of a drive-by at the time he fired his gun at Niles’ 1992 Honda, and he was “faced with what he thought was an imminent threat” from Niles’ car, Rutherford said. Murphy also heard conflicting testimony as to whether anyone fired at Scott while he was in the front yard that night. According to police, who took statements from people at the scene that night, Scott fired first. However, Rutherford presented witnesses who said someone fired a shot at Scott before he fired. So I'm puzzled. Was Scott's life in danger? I mean truly in danger according to the facts? He thought it was an imminent threat? His daughter and friends were safely in the house when the shooting occurred. Couldn't he have called the police and let them deal with the guys following his daughter and her friends? And he can't be expected to shoot straight because you don't have to when your life is in danger? Hmmmm. Really? 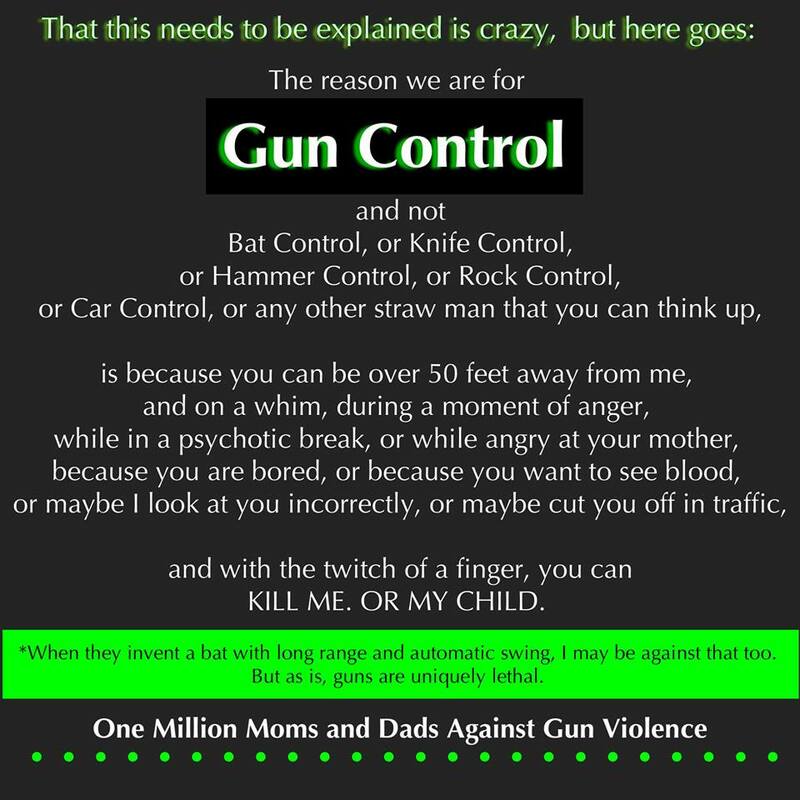 So then why have a gun for self defense if you can't be expected to shoot straight when you use it in self defense? Raise your hand if this makes sense to you. When gun toting citizens start standing their ground in more and more states where the laws are in effect, can we expect to see collateral damage like in this case? Is that OK? Is this the kind of communities we want? Is this the kind of gun culture we want or need in our country? I think these are serious questions that deserve serious answers. So what should we do? We can pass a bill to require background checks on all gun sales. We can limit who carries loaded guns in public and where they carry them. We can limit the number of rounds in an ammunition magazine. We can require gun owners to report stolen guns. We can take another look at our concealed carry and stand your ground laws. We can fund the ATF properly so they can crack down on bad apple gun dealers and deal with gun trafficking. We can provide funding for research into the causes and effects of gun violence so we can move forward with solutions. Why are we not doing what we can to prevent gun injuries and deaths? It's simple- the influence of the corporate gun lobby on our elected leaders; the perception that doing anything to tighten gun laws will anger gun toting voters; the mistaken idea that the public is not in favor of common sense gun laws; the American gun culture which is ingrained in our overall culture and affects our views of public health and safety. It's definitely time for a change. We can do better than we are now doing. In this particular instance I find myself in agreement with you -- the man is responsible for the bullet he fired even in self defense. However, I have a question for you. As I recall you vigorously defended the New York policemen who shot 9 innocent bystanders. Why are they immune and not this gentleman? "But when they do fire, even at an armed suspect, there is often no one returning fire at the officers. Officers hit their targets roughly 34 percent of the time. Officers’ guns go off unintentionally or by accident for a variety of reasons: wrestling with suspects, cleaning the weapons, leaning on holsters — even once, in 1996, when a gun was put in an oven for safekeeping." The Officers are still civilly liable for any injury caused to a bystander, which is not the case with "get away with murder" laws. In fact, those laws take away any right to civil litigation, which may be unconstitutional in Florida (Article I, SECTION 21: Access to courts.—The courts shall be open to every person for redress of any injury, and justice shall be administered without sale, denial or delay.). Anyway, It is a police officer's JOB to enforce the laws, which is why they are allowed to carry guns and given a bit more latitude to do their job than the average citizen. But, as I said, the NYPD could still be liable for damages if it is shown that any injuries resulted from negligence on the part of the police. That is the key to the matter, there must be a showing of negligence, that is that the officers did something which was risky, unnecessary, and not within common and accepted practise, or that the use of their firearms was excessive force. "Matthews and Sinishtaj will be assigned to administrative duty pending a police review of the shooting, a standard procedure whenever an officer discharges his weapon in the line of duty." That's not immune from consequences. On the other hand, being granted immunity from Criminal and civil liability for negligence certainly is. And, as I pointed out, in the the case of Florida's "get away with murder" law is probably unconstitutional. "That's not immune from consequences." Really? You are 11 times more likely to be mistakenly shot by the police than you are by a civilian with a gun yet both civilians and police have roughly equal numbers of justified shootings each year. On the unjustified shootings such as the police in New York how many police ever face criminal charges? How many of the police actually pay anything out of their own pocket in civil cases? What about this thing called "qualified immunity?" Could we call that a "get away with whatever you want" law? BTW, nice terminology there. "Get away with murder laws." I like it. Like "murder clips" and "assault weapons" it makes a statement. I have to give you guys credit with the ability to turn a phrase. The error rate for police is 11%. What this means is that you are more than 5 times more likely to be accidentally shot by a policeman than by an armed citizen." Is this what you meant when you thought you had a statistic to throw at me? Officers face life threatening situations every day unlike conceal carry permit holders who rarely if ever face a situation where they would need a gun. Officers are more highly trained than the average permit holder, some of whom get only on-line "training" to get a permit or no training at all. No wonder there are so many accidents and intentional shootings or mistakes made by permit holders. Your information seems to be coming from gun rights sources who haven't done studies about this. Officers miss 34% of the time according to the link I provided. Let me know if you find anything factual about your assertions. Otherwise don't make false assertions. I provide links for my information. Laci knows the law and has provided some factual information. The vast majority of the law enforcement officers in this country perform their very difficult jobs with respect for their communities and in compliance with the law. Even so, there are incidents in which this is not the case. This document outlines the laws enforced by the United States Department of Justice (DOJ) that address police misconduct and explains how you can file a complaint with DOJ if you believe that your rights have been violated.
" You are 11 times more likely to be mistakenly shot by the police than you are by a civilian with a gun yet both civilians and police have roughly equal numbers of justified shootings each year." " In Indiana, police officers are upset over a new law allowing residents to use deadly force against public servants, including law enforcement officers, who unlawfully enter their homes. The law was signed by Republican Governor Mitch Daniels in March, reports the San Francisco Chronicle. The law was adopted after the Indiana State Supreme Court ruled that there was “no right to reasonably resist unlawful entry by police officers," after a man assaulted an officer during a domestic violence call. The law's author, Republican state Sen. Michael Young, said there haven't been any cases [yet] in which people have used the law to justify shooting police. The National Rifle Association lobbied for the new law, claiming that the Indiana State Supreme Court decision had legalized police to commit unjustified entries. Indiana is the first U.S. state to specifically allow force against officers, according to the Association of Prosecuting Attorneys in Washington, which represents prosecutors." I find what is going on with these stand your ground crimes scary as hell. 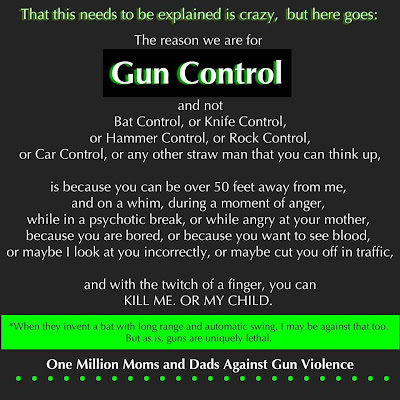 How can anybody be safe; jogging in your neighborhood, walking the dog, driving to work...the turn of events in this country to shooting and killing somebody when you don't like what they are doing is monsterous. There's no law that allows someone to just shoot and kill someone because they don't like what someone is doing - even in a state that has a "stand your ground" type of law. There must be a clear and immediate danger to one's life or the life of another, or one of a handful of other specific criteria, in order to use deadly force. "Not liking what someone is doing" is not one of those criteria. And yet, there's George Zimmerman who had no reason to follow Trayvon Martin and should not have been carrying his gun that night while on patrol for the neighborhood watch. And yet, there's the man who shot into a car full of kids because he didn't like their loud music. So yes, Bryan, the SYG laws make people think they can shoot people because they don't like something they are doing. That's the point, of course, that you conveniently missed.